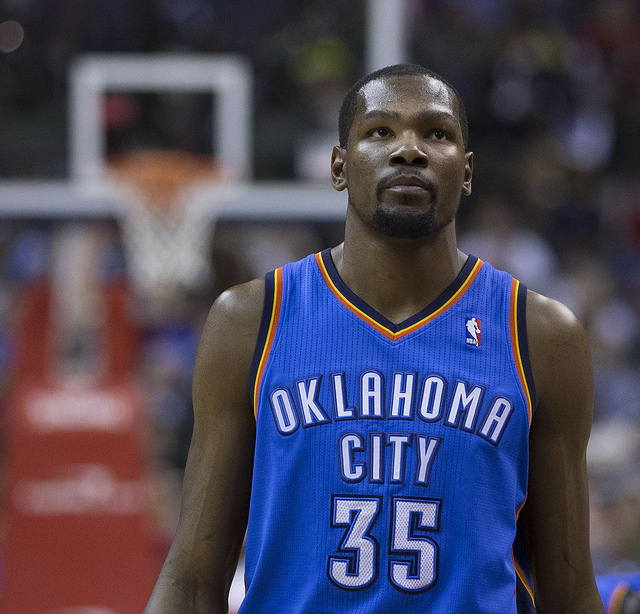 After weeks of tepid, not-really-speculation, Kevin Durant was finally awarded the NBA’s 2014 Most Valuable Player Award. The 25-year-old small forward for the Oklahoma City Thunder absolutely deserves it, too, putting up a season not seen since an in-his-prime Michael Jordan — averaging 32 points, 7.5 rebounds, and 5.5 assists a game. Even LeBron James, the reigning MVP and general consensus pick for “best player on the planet” admitted that KD had earned the award, and the voters thought so as well: Durant snagged all but six first place votes (the dissenters voted for LeBron). But Durant didn’t remind us of LeBron or even Michael Jordan at the outset of Round 2, the day before he officially received his award (and the reports were all leaking that he’d won it). No, on Monday night, Kevin Durant reminded us of David Robinson, the Hall of Fame center for the San Antonio Spurs. And not in a particularly good way. By any metric, one of the other best players in the NBA is Los Angeles Clippers point guard Chris Paul. Paul, who finished seventh in MVP votes, has long been regarded as that rare kind of superstar who is so good it barely matters that his teams have rarely advanced in the post-season (normally a typical requirement for being considered a top-tier player). He led the Clippers to a Game 1 rout of the Thunder that recalled, at least in spirit, the drubbing that Hakeem Olajuwon and the Houston Rockets gave to Robinson and the Spurs after Robinson was awarded his MVP trophy. Not only was Paul the best player on the floor in that first game of the series (he finished with 32 points and 10 assists), his team completely scrubbed the floor with Durant’s squad, leaving considerable doubt on an OKC team that had a hard enough time making it out of the first round. Taking the time to thank his family as well as each of his teammates by name, Durant fought back tears as he recounted his positive experiences in the NBA as well as the motivating factors behind his failures. Veterans like Derek Fisher, Nick Collison, and Kendrick Perkins were singled out as guiding lights — Collison was cited as the first NBA teammate Durant ever met, dating back to their days in Seattle — while peers like Serge Ibaka and Russell Westbrook received equal amounts of praise. In his speech, Durant came off less Michael Jordan than he did Dennis Rodman, a player who was similarly broken up when he was honored by the NBA. Durant clearly cares deeply about his teammates and his family, and it was good to see another MVP caliber player who isn’t just a basketball drone.